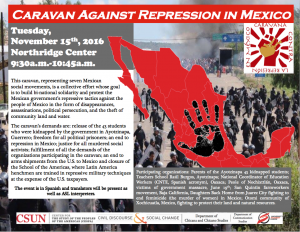 A coalition of seven organizations fighting the rise of violence in Mexico will be at California State University, Northridge on Tuesday, Nov. 15, to talk about what is happening in their home country. The discussion will take place from 9:30 to 10:45 a.m. in the Northridge Center of the University Student Union, located on the east side of the campus at 18111 Nordhoff St. in Northridge. Escobar said among those taking part in the presentation are San Quintin farm workers from Baja California, parents of some of the 43 missing college students who are believed to have been kidnapped two years ago, and the mothers of women who were murdered in Ciudad Juarez. The presentation is being sponsored by CSUN’s Center for the Study of the Peoples of the Americas, Civil Discourse and Social Change initiative, Department of Chicana and Chicano Studies, Department of Communication Studies and University Student Union. For more information, contact Escobar at martha.d.escobar@csun.edu.